Part of a larger science campus beautifully set amid several native San Diego canyons within a Torrey Pines grove, Green Acre serves not only as a restaurant for tenants and the public, but also a stunning event space complete with private meeting rooms, state of the art electronics, lush landscapes, stunning outdoor venues and the expertise of Chef Malarkey at the helm of the kitchen. 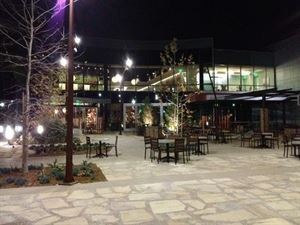 The eatery is situated as one of the main entrances to the Alexandria campus with views of two canyons and rustic landscaping. The creation of two innovative gardens: a terraced garden with amphitheater steps, stairs, and groves of trees and canyon and succulent plants defined by an orchestra of curved weathered steel walls; and a succulent and grass roof top garden ground level of the campus. Green Acre is not only part of the campus, but the community within the Campus Point build-out, making it a destination for excellent food and events, in addition to its stunning landscape architecture. The Green Acre Eatery includes expansive multi-functional space including multiple outdoor patio and garden areas, private dining rooms and atrium seating spaces. The venue offers natural light and unique architectural features. Multiple television screens throughout the space allow for convenient entertainment and branding opportunities.